We hope you will join us at 6 p.m. on Tuesday, Jan. 22 for the Clayton Town Council meeting inside The Clayton Center/Town Hall, 111 East Second Street in Downtown Clayton. Due to the Martin Luther King Jr. holiday on Monday, Town facilities are CLOSED on Monday and that has pushed the Town Council meeting one day later to Tuesday. 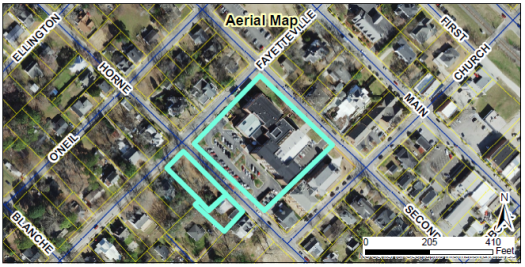 Council will open a Public Hearing prior to voting on the staff request to rezon e three parcels located at Town Hall/The Clayton Center, 111 East Second Street, as well as two smaller parcels at 117-121 Horne Street. The parcels currently include two historic schoolhouses which were renovated into a municipal/performing arts/conference center complex, green space and two vacant single-family homes. The request is to change these properties from Residential-6 (R-6) and Office-Institutional (O-I) to Public Facilities (PF). If rezoned, the Town plans to redevelop the existing parking lot at Town Hall, incorporate the two new parcels, permanently close off a portion of Horne Street, and incorporate all of that land into a new, larger parking lot. Ultimately, the new lot will more than double the number of parking spaces available for employees and visitors of the Town Hall/Clayton Center, from 41 spaces to 110. The additional parking will also be available for use by Horne Memorial Methodist Church, the Clayton Library and Town Square events during peak times of need. At a meeting with adjacent property owners, residents shared concerns about lighting, buffers and additional traffic. Staff will present a new rendering of the parking lot to assist residents and Council in better understanding the expansion and abandonment of Horne Square. For additional questions prior to the meeting, please call the Planning Department at 919-359-9399. Chief Blair Myhand will introduce the newest members of the Clayton Police Department. The four new officers are filling vacant positions on the force. They are Patrick Smith, Gregory Morris, Victoria Lee, and Timothy Marquis. Officer Smith lives in Clayton and has more than 5 years of experience with the Morrisville and Roanoke Rapids Police Departments. Officer Morris also resides in Clayton and worked on the Raleigh-Durham Airport Authority Police Department. Victoria Lee, of Angier, and Timothy Marquis, of Clayton, both just graduated from Basic Law Enforcement Training. Their first day on the job will be the night of this Council meeting! All are excited to be joining the Clayton Police family. Please say hello when you see them on patrol! Chief Myhand will also update the Council on a Clayton Police Department first. Two Clayton Police officers are now serving as the Town's first-ever School Resource Officers. The Town of Clayton and the Johnston County’s School Board have partnered through a state grant aimed at increasing safety in schools. Officers Aurora Mayo and Scott Holzshu jumped at the chance to volunteered for this special duty. Clayton Middle School, Cooper Academy and West Clayton Elementary welcomed Officer Aurora Mayo last week. And Riverwood Middle and Riverwood Elementary Schools opened their arms and doors to Officer Holzshu. The School Resource Officer (SRO) Program is designed to promote safety, good student-to-officer interaction, mentorship, guidance, and communication between school personnel, students, parents and police. Ken Anderson of Anderson Smith & Wike PLLC will deliver the annual independent audit of the Town's finances for the fiscal year that ended June 30, 2017. The bottom line: Clayton received a clean audit. Click here to view the Town's Comprehensive Annual Financial Report. Prepared by Finance Director Robert McKie, this document has won awards for 17 years and counting. McKie will also give Council a report on how the previous fiscal year's books matched up against Council-adopted policies and key growth rates. Rising Tide Building & Renovations is petitioning to voluntarily annex the property at 1218 W. Main Street into the Town of Clayton. This is a non-contiguous annexation of about .58 acres in a Business 3 zoning district – there is no change in zoning requested. Rising Tide recently was approved to renovate and improve this once-vacant building just before the train trestle underpass heading toward Shotwell Road to become the new home of their contracting business. Council will hold a public hearing prior to voting. New Trinity Missionary Baptist Church is applying for a rezoning on properties at 347 W. Main Street and 317 W. 2nd Street. The church would like to rezone a portion of these properties from Central Business (B-1) to Neighborhood Business (B-2). Both properties have frontage along Main Street and Second Street and the request is rezone all but the portions that have frontage on Main Street, leaving those B-1 . The properties nearby are generally commercial, with some office and church uses. In its application, the church stated that after examining the Town of Clayton’s predicted growth rate, they need to make plans to accommodate that growth. The rezoning lays the groundwork for New Trinity Baptist to build a sanctuary to accommodate potential new members. Staff recommends approval and the Planning Board recommended approval at its December meeting finding the rezoning consistent with the Town’s Comprehensive Plan 2040, which promotes quality redevelopment of under-utilized sites, as well as building that invigorates and invests in the downtown core area. Council is being requested to set a Public Hearing and vote for its January 22 Town Council meeting on this rezoning. Remember, there is always a public comment session at the end of each meeting to address the Council. As Town staff begins work on the 2019-20 budget, Town Manager Adam Lindsay would like to give the public a chance to share its thoughts on how Clayton should prioritize spending. The Town has always given the public a chance to weigh-in before approving the budget, but two years ago, Lindsay asked the Council to open the floor for comments at both the beginning AND the end of the process. The new budget will outline spending for the upcoming fiscal year, which runs from July 1, 2019 to June 30, 2020. The public will have another chance to comment once the proposed budget draft is available, usually in late May or early April. John Francis and his family are requesting a Special Use Permit to develop a private family cemetery on a portion of their land at 875 Bobbit Road. subject property. The property is 53 acres and has one home. The cemetery will be limited to 32 plots and will not be open to the public. More information, including site plans and staff reports, will be included in future agenda packets. For more, call the Planning Department at 919-359-9399. This is a request to develop 8 single-family homes on 32.02 acres of land zoned Residential-Estate (R-E) off Ranch Road. The property is north of the Ranch Road and US Hwy 70 W. (70 Bypass) interchange and is located in the Exterritorial Jurisdiction (ETJ) of Clayton. The proposed density is 1 lot per 3.987 acres. The proposed lots will be served by public water (Johnston County) and on-site septic. Electrical provider is Duke Energy Progress. The proposed lots will be accessed off Ranch Road. More information, including site plans and staff reports, will be included in future agenda packets. For more, call the Planning Department at 919-359-9399.??????? The public is again invited to attend the Town Council meeting on Monday, Feb. 18 to listen and share comments as consultants continue to study how to best plan and pay for the expansion of our wastewater sewer capacity and possible replacement of the Town’s wastewater treatment plant. The Town has continued to grow and we’re reaching capacity levels that dictate the need to expand. This is a continuation of public hearing/discussion first held on Nov. 19 and continued through December. Original baseline calculations presented in October called for building a new plant within 4 years on that designated piece of land, and to pay for the project by raising sewer fees and rates for most homeowners an average of about $15 a month starting July 1, 2019. The study also calls for annual 30% sewer rate and 2% water rate increases for the following three years. Upon hearing those baseline costs, Town Council requested staff and consultants research options to build a treatment plant in phases, partner with regional and private entities, operate two facilities, and/or operate a single facility. The new scenarios were run and did bring rate increases down. Consultants examined 20 different scenarios and narrowed the options to five, which were presented at the Jan. 7 meeting. On Feb. 18th, they will present more information on those models and work to present the most viable option and its possible rate implications. You can find more information at ClaytonNC.org, including audio from these past public hearings. If you have any questions about the agenda or any other Town-related issues, please feel free to email Public Information Officer Stacy Beard or call her at 919-358-0348. Have a great weekend, and we hope to see you at the Tuesday meeting. If you can't make it, the Town Clerk's office works to publish the audio from the evening Council meeting the following morning. Just check back to the agenda and you'll see an "Audio" button at the top left corner of the agenda.